A fun little gift he or she will adore and a perfect gift from the kids for her Birthday or Mother's Day. 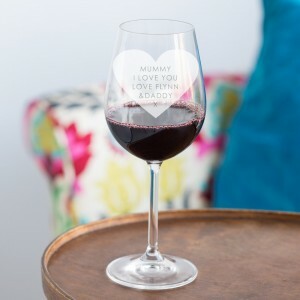 Our sweet heart wine glass design will definitely bring a smile to a face and for those around! Your message of 75 characters max is engraved onto the wine glass in a contemporary font reading whatever you like...go on be creative! Each wine glass is etched in our studio on the Isle of Wight and as standard, your glass comes wrapped in bubble and sent in a sturdy box.If you're sending direct to the recipient, we can pop your gift in a gorgeous pearl grey quality gift bag with hand written gift card. Just choose from the drop down menu, only an extra £4!